Here's How to Easily List Dozens of FSBOs With No “Prospecting” Whatsoever! Yeah, FSBOs can sometimes be a tough nut to crack. The good news is their sales resistance, when approached correctly, will almost instantly melt away. The best part is there are huge opportunities in the FSBO market, and success is just a few simple steps away, when you have the right strategy. It's not about high-powered sales techniques or some brilliantly worded FSBO scripts. No the answer is much simpler. It's a trigger that's wired into human nature and with very little effort you can have FSBOs actually calling you wanting to list. But first let's talk about the actual numbers, in any given year, roughly 18%-23% of the homes for sale across the country are FSBO. However, less than 1/3 of FSBOs actually sell successfully on their own. Meaning roughly two out of every three FSBOs eventually wind up listing with an agent. So when it comes to real estate lead generation, FSBOs and Expired listings are my two favorite market niches. The reason I like them so much is they both have a "demonstrated interest." They raised their hands and said, "I want to sell." Plus I can easily relate to those seller's feelings. I can appreciate the fact that the FSBO is trying to keep as much of their equity as possible. As a businessperson, it’s easy to see where they are coming from. And when you can relate to your prospect’s feelings, it’s easy to develop an effective strategy to penetrate their tough exterior. Think about it. They are simply trying to save money. But you and I know that the vast majority of FSBOs don't have the wherewithal to complete the transaction smoothly, and often lose money trying to sell on their own. Plus there are intimidating factors that continuously weigh on the FSBO's thoughts and can keep them laying awake nights. They don’t understand all the intricacies and nuances of a real estate transaction. This is where your opportunities are, in the intricacies and nuances of the transaction process. The first and biggest hurdle to the FSBO market is their defensive posture. There’s a huge barrier of sales resistance. You know what I mean. If you’ve ever called a FSBO, there is a good chance they hung up on you. They are always on their guard. So how do you break through that shell? Don't prospect them, provide consumer-based free services that have them asking you for help. As a Realtor, the sales resistance factor is so high that you've got to be patient and focus on building trust with your FSBO prospects first. Here’s an example of how our clients provide our real estate marketing system as a free service, and in turn win their trust before ever attempting to list the FSBO. The above picture has a sample demonstration line. Feel free to call and check out exactly how it works. It fully automated and you can check it out at 1-800-959-6550 ext. 1007 anytime 24 hrs. Do you get the gist of it? The strategy is first to break-down the barrier of resistance. What’s the best way to do that? Don’t threaten their equity. Whenever an agent calls, the FSBO is immediately defending their equity. They see you as being out to get 6%-7%, which may represent a huge chunk of their total equity! By leading with free services it's easy to get them to open up. Plus, when you incorporate your lender, it doesn't cost them anything either. The lender is a service person who makes money without charging them fees. So an important step to this strategy, if you're going to partner with your lender, is to work with a hard-working lender. Find a lender who has what I call a good "hunger factor". The "hunger factor" is critical to the success of the partnership. Many of the agents we work with have great lending affiliates but they have a low hunger factor. If a lender has five or six top producers feeding them leads, they don’t need or necessarily have the ability to handle more business. Another thing to consider in selecting the right lender for this strategy is their attitude toward innovation. This is an innovative strategy and if the lender you’re thinking about isn’t really aggressive about new ways to generate more business they might not be the right candidate. The bottom line is this strategy can work independently, or with a lender. However, if you're going to work with a lender it's worth taking your time to hand pick the right lending affiliate. The approach has been incredibly effective and if you have any doubts about your lender’s commitment to it, you should move on to someone else. This strategy, executed well, will make you both tens of thousands of dollars. Which brings me to my next point. If the approach is making your lender thousands of dollars…who should pay for it? Hmm…are you with me? Your lender should be picking up the tab…or at least a really good portion of it. In fact, I would estimate that about 20-30% of our agents don’t pay for their service with us…their lenders do. Lastly, if you are going to get your lender involved, you need to have a well-organized plan for your presentation. If you don’t, your lender may say "yes" and pay for a portion of your bill, but that’s not the entire objective here. You want your lender to be fully committed to working the system for maximum effectiveness. Selling it to your lender should be easy because of your position. You’re a profit center to them. They already value your contributions, so they should be all ears. But – this is really important – if you're going to get the most from this strategy, you still have to present it well and sell them on what’s in it for them. Once you’ve prepared your presentation materials call your lender and set a time to get together with them to discuss the strategy. The main thing to keep in mind as you are presenting this to your affiliate, it's like a listing presentation, you need to clearly answer, "What’s in it for them?" Really focus on how this service and these strategies will benefit them. Show them the potential for generating tons of loan apps from the FSBO market. Our agent in Florida explained the way he approached his lender like this, "I first showed her my real estate marketing and advertising and then a list of all my leads. After that I called my MVR system and gave her a live demonstration – just like I do on my listing appointments. I went on to explain how this new system generates hundreds of calls and how she could benefit from those calls, too. Then we got into the FSBO idea. I explained how the FSBO market is a great market, but because I’m an agent, it's harder for me to get their interest than it would be for her. She was on the same page immediately. She could easily see the potential." Now his affiliate "loans" the MVR system to FSBOs. The FSBO advertises it online, in the newspaper, and various other sources. 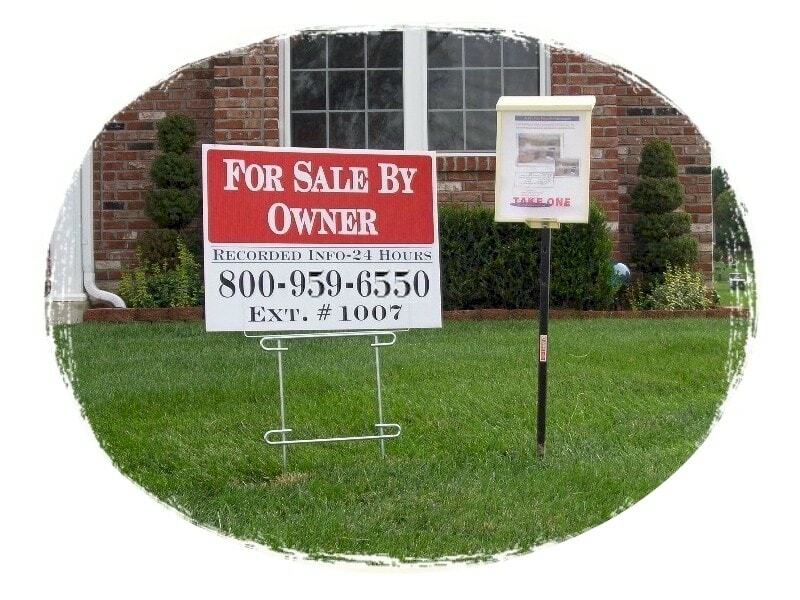 The lender puts a sign in each of the FSBOs’ yards and posts the property on a variety of free online sources like Craig's List. Between the sign and online ads she generates a ton of calls and...they’re all potential loan applications and potential buyers for you. Now here’s the best part. Within 30-45 days most FSBOs are getting frustrated. That’s when your lender recommends they list with you. And guess what? More than 3 out of 4 times they list with you because they already have a trusting relationship with your lender. It’s a win-win-win deal all around. The FSBO gets free advertising and a free group of services. The lender gets loan apps. And you get listings and pre-qualified buyers. Now do you see why I’m so excited about FSBOs? They’re a great market! To download our entire FSBO Strategy Guide (including copy-and-paste marketing templates, a lender-marketing package, and a 41 page e-book!) for free simply fill out the form below. We’ll also include our 7 part video series that details several other actionable real estate marketing tactics like this one to help you grow your business.